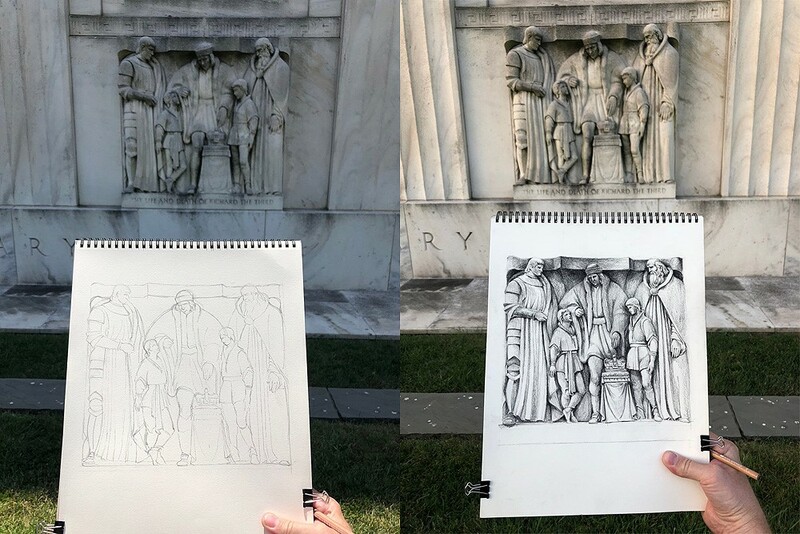 This is the eighth post in a series by artist Paul Glenshaw about drawing the bas-reliefs by sculptor John Gregory on the front of the Folger Shakespeare Library building. The series examines the bas-reliefs one by one; each sculpture depicts a scene from a different Shakespeare play. 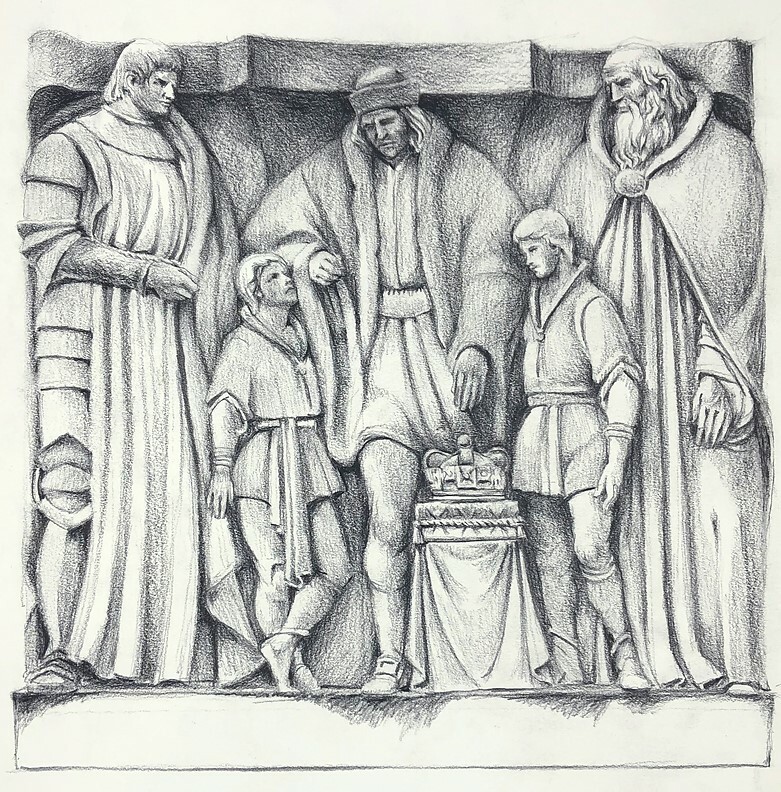 Today’s post is about the bas-relief of a scene from Richard III. Shakespeare’s Richard III is a bad guy. He tells us so in the very first speech of the play: “I am determined to prove a villain/And hate the idle pleasures of these days.” Richard succeeds in wooing and marrying Lady Anne, even though she hates him for killing her father-in-law, Henry VI, and her husband. She later becomes one of his casualties as he murders his way to capturing the throne for himself—killing his surviving brother Clarence and other rivals and comrades before meeting his own bloody end on Bosworth Field. Which brings us to John Gregory’s sculpture. In the original list of scenes to be depicted in the nine reliefs, Henry Folger made specific recommendations. Two were changed by Gregory and Emily Folger—the ones for Midsummer Night’s Dream and Romeo and Juliet. I wonder if Gregory was puzzled by Henry Folger’s selection for Richard III—Act III, Scene 1. 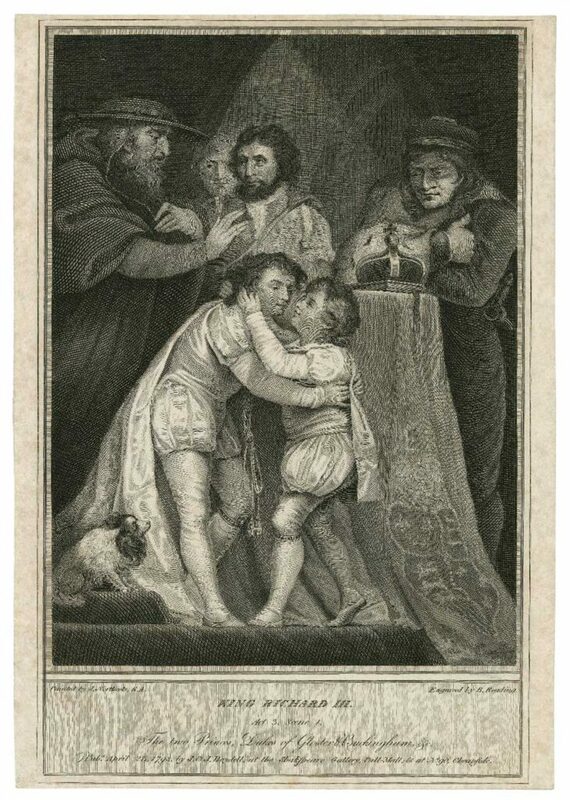 Of all the moments of villainy in the play, Folger chose the one moment Richard has with his nephews before he sends them to their doom in the Tower of London. The scenes chosen for almost all the other sculptures are ripe for dramatic illustration—the murder of Julius Caesar or the storm in King Lear being great examples. But Richard and his nephews are simply talking. How to convey the play’s violence, turmoil, and ruthless ambition in the depiction of a conversation between an uncle and his nephews? Gregory found a way: with menace. Gregory’s convention of a continuous architectural form caps the top of the sculpture, and creates a rather cramped space for the figures. Richard dominates the center, his head bent over and pressing up against the lintel, his shoulders arching (with one slightly larger than the other to suggest his ‘’deformed, unfinished” physique) as his arms encompass the two young princes. The taller boy is the dead king’s oldest son, Prince Edward. He is to be crowned King Edward V. The smaller one is Richard, the Duke of York. By this point in the play, the boys are the final obstacles to Richard’s attainment of the throne. The Duke of Buckingham, one of Richard’s henchmen, and the Archbishop of Canterbury, Cardinal Boucher, box in the royal trio on either side. The princes have no way to escape. It is unclear exactly which moment Gregory is showing, but to me, it’s when Richard has just told the boys that they’re going to the tower—as their protector, he says this is for their own good. York objects, saying he fears the ghost of Clarence, his dead uncle. Prince Edward makes a show of bravery, saying, “I fear no dead uncles,” to which Richard replies, “Nor none that live, I hope.” Richard’s menace is enhanced by Gregory with the inclusion of a prop not mentioned in the play—a royal crown, set in between Richard and Edward, with Richard’s hand hovering above it. A moment later, the boys leave the scene, and never come back. Drawing Richard III was challenging in unexpected ways. Unlike Lear or Julius Caesar, where there are huge baroque swoops and curves, Richard was all about subtle, malevolent pressure. Buckingham and Boucher look like columns, perfectly vertical, except for their inclined heads. The three adults tower over and close in on the boys. So the challenge was not to let the two princes get overwhelmed visually. Gregory does this by giving young Prince Richard the only hint at movement—his one leg is crossed over the other, and he looks up to speak to Richard directly. But still, I had to keep enlarging the boys as I went. It was as if I was letting the others actually crush them out of the picture. The other challenge—and sometimes it’s the simple things that get you—was Richard’s hat. It’s a very simple form. There’s nothing at first glance that gave me concern. But I must have redrawn it about five times—somehow getting its roundness and it popping off against the lintel at the same time was a bear. King Richard III, act 3, scene 1: The two Princes, Dukes of Gloster & Buckingham &c. [graphic] / painted by J. Northcote R.A. ; engraved by B. Reading. This depiction of the scene from the Folger’s collection has many of the same elements as the Gregory sculpture, but with more exaggerated motion and emotion. Looking to the next bas-relief, I saw the one I’d been waiting to draw from the very first moment I saw the sculptures—Hamlet. An angry ghost, a rattled and remorseful Queen, and a tortured Prince were waiting. Editor’s Note: This blog post has been corrected to say that Richard III marries Lady Anne, not the widow of Edward IV. We regret the error.